The Euro Falle family - 05 at the bottom. Hi guys, I've had a rather busy weekend at the end of a week of annual leave. My week has been full of household chores (leaving me rather stiff and sore) and then finished off with a special Midlands Puzzle Party in the home town of Dr Simon Nightingale, who has received more IPP design competition trophies than anyone else in history. We had a great time and lots of recent IPP puzzles were shown off and even a magic show was delivered. This has left me with very little time for a blog post so I am delighted that the Mike Desilets, the PuzzleMad roving reporter, has stepped up to the mark and delivered a public service announcement for you. It’s a rather sad occasion for me as I find myself the bearer of less-than-happy news about a new puzzle that has just hit the market. I actually had some other work underway for Puzzlemad, but a catastrophic puzzling experience this past week has stimulated me to produce this rush job of an article. I’ve rushed it to press because I suspect that there are folks out there with a finger hovering over the “buy” button for this particular puzzle and I wanted to get this information out quickly to facilitate informed decision making. Informed spending, I should say. Euro Falle 05 - a Siebenstein Spiele production. The puzzle of which I speak is the very recently released Euro Falle 05, the fourth in a series that seems to have started, oddly, at 02. You can find my review of the earlier Euro Falles here and here if you are new to the blog. With some slight reservations, I have been a fan of the series and was happy to have purchased and played with them. My misgivings were due largely to construction problems. I experienced more of these issues subsequent to the blog reviews, but did not see fit to make an issue of it. However, having plunked down yet more good money for the new Euro Falle 05 and given it a play, I feel I will now have to terminate my relationship with them, effective immediately (Ed - very strong stuff!). Unfortunately, I cannot divulge the exact nature of the deficiency without completely spoiling the puzzle. What I can say is that in the course of two solves of Euro Falle 05 (solved correctly, as designed, I assure you) the puzzle has become completely unusable. As you may know, damaged goods always find their way to me for some reason. I have come to terms with that fact and learned to take it in stride. However, I believe the issue with this puzzle is no fluke. I don’t think I simply got the bad one in the lot. The problem seems to be directly related to the engineering and construction of the puzzle. I could be wrong (I sure hope I am), but I think this is going to be the norm with this puzzle, and I want you to be aware of, at the very least, the potential to have completely wasted your money. Well, I guess you will get to play with it at least once, so not a complete waste, but nearly so. That’s really the most I can say about it on the front page of Puzzlemad. However, if you already have this puzzle and have solved it (I saw a shot of it on Allard’s blog, amidst his IPP haul, so I assume there are quite a few out there already), or if you don’t intend to buy it anyway, or you do but you don’t care about the solving experience, then click the spoiler button below. Behind that button I show the innards and explain the nature of the problem in excruciating detail, as well as discuss repair options. Again, this will be a complete spoiler, so think it over before you click. Along those same lines, I may spoil other puzzles for you behind that magic button if I feel the need to make comparison with other puzzles and mechanisms. That section is really meant for the serious collector, designer, and/or puzzler who doesn’t mind an unbarred discussion. You’ve been warned! 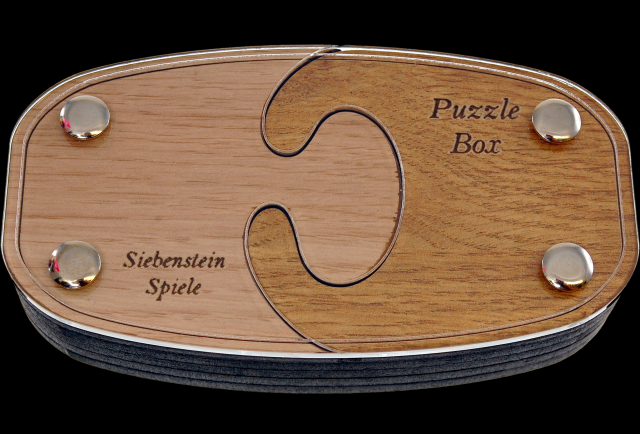 One other piece of information I think puzzlers should know regarding Euro Falle 05 is that the solution is the same as for another very recently released, and very attractive, puzzle from Siebenstein Spiele. Exactly the same. If you are like me, you don’t really need to have two similar forms of the same puzzle. Or at least when you do, you make the decision consciously, due to some aesthetic or collectability factor. Personally, I was more than a bit disappointed when I discovered these two were functionally the same. And then, to add insult to injury, one of them self-destructed! Know, however, that the ‘other’ puzzle, although having the exact same mechanism, has functioned just fine so far and I am very pleased with it in all respects. If you have had a different experience with Euro Falle 05, please do register your opinion in the comments below. If for some reason I received the only bad one in the batch, it would be good for everyone to know that and downgrade my dire warnings accordingly. If you are the adventurous type and just have to experience it for yourself, Euro Falle 05 is now up on the shelf at Puzzle-shop.de and, of course, Puzzlemaster. If you clicked the button, you now find yourself here reading a post-mortem page. Congratulations! If you didn’t mean to click, then for God’s sake avert your eyes. At this point it bears repeating that although Kevin grants me the honor of contributing to Puzzlemad, he is in no way responsible for this particular content other than editing out the foul language (Ed - I have plenty of foul language of my own - I was born in the East End of London!). It’s all on me, baby. Euro Falle 05 solved and showing it's innards - a very neat idea! Let’s keep this quick and clinical. 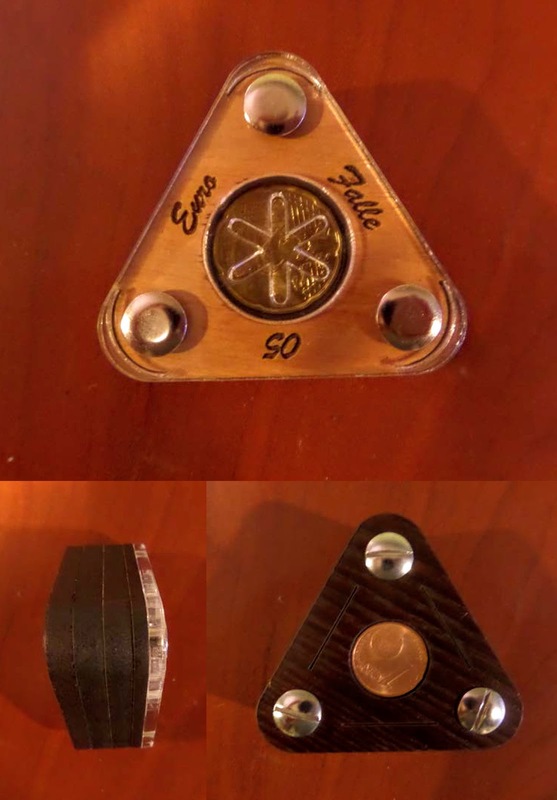 The Euro Falle 05 is conceptually brilliant in that it relies, at least to some degree, on a puzzler’s knowledge of the construction and functioning of the prior Euro Falle puzzles. 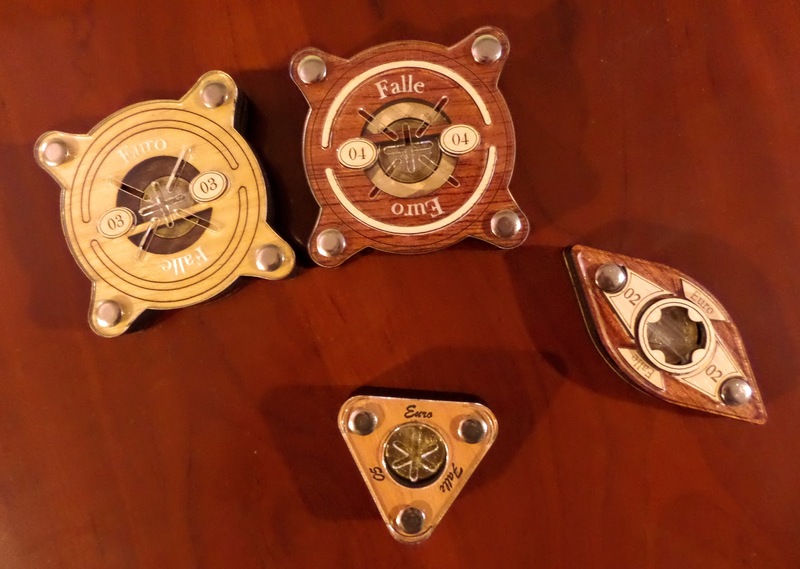 All previous Euro Falle were constructed using fully screwed-down layers of laser-cut wood. The screws were not part of any trick or solution, rather they were perfectly functional in holding the puzzle together. Euro Falle 05 presents the same construction - apparently. But in reality, the screw heads on the front and back are not connected. The structure is actually two separate halves held together at the center with very strong neodymium magnets. To free your 20 cent coin, you simply need to pull hard in opposite directions, perpendicular to the plane of the puzzle (or nearly so, more on that below). If you pull hard enough, the halves separate and your coin falls out. At this point you realize that the one cent coin on the back side was a complete decoy, again playing on expectations from the earlier Euro Falle. Excellent!! The problem with the puzzle is that, apparently, the magnets that hold the halves together are simply too strong. They are so strong that the adhesives and the (non-existent) surface tension of their holes cannot keep them in place. The magnets would much rather remain with each other than remain part of the puzzle. Upon my first opening of the puzzle, one magnet detached from its spot. I stuck it back in, rejoined the halves, and opened it again. Now I had four detached magnets and one other partially out. In staging the photos for this post, all of the rest came out. Furthermore, one of the back-side false screw heads fell out. These back-side false screws are simply glued in. The front-side screws are actually bound pin-to-screw, thankfully, and quite secure. But the back ones seem to have only a tenuous hold. Magnets everywhere... except where they should be! The puzzle doesn't work well in this state. A screw loose, to say the least! Analysis: The magnets may simply be too strong for the puzzle. They are very strong indeed. When you don’t have the leverage of the puzzle, and they are just stuck to each other, they are almost impossible to separate. It is clear that glue was used in each hole and its glossy, perfectly smooth surface is clearly visible. If you’ve ever tried to glue two very smooth surfaces, of different materials, you know that the hold will probably be bad. I’ve never had much luck with it. So I think it was a mistake to depend so much on the glue itself. Of course, it does need to be glued, but that alone is insufficient. What is equally or more important is the grip provided by the side-walls of the holes. Good purchase can always be had with a nice tight fit. The fit should ideally be such that you need to tap the item in firmly with a little hammer. They should just barely squeeze into the hole, pressing hard against the wood. Alas, not so with my Euro Falle 05. The holes are, in my opinion, significantly over-bored. 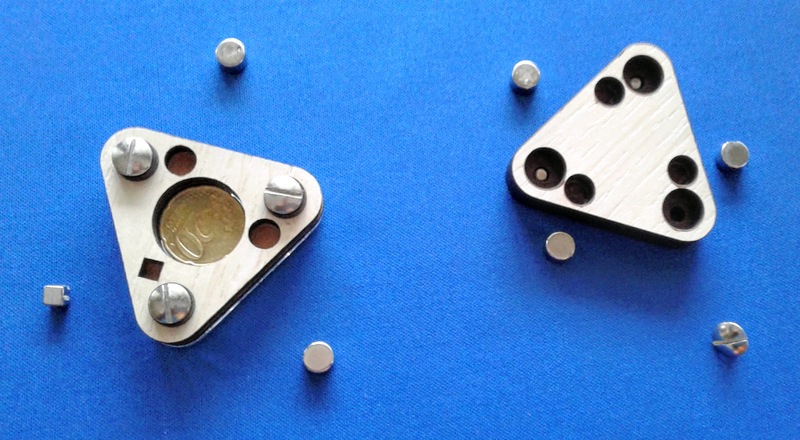 The magnets fit loosely in the holes and there is no tension whatsoever holding them to the puzzle. The glue bears all the burden. A good tight fit, with glue, might have held these magnets in. I say might because they are just so darn strong. I forgot to mention one important aspect of the solution earlier. There are three pairs of magnets holding the puzzle together. 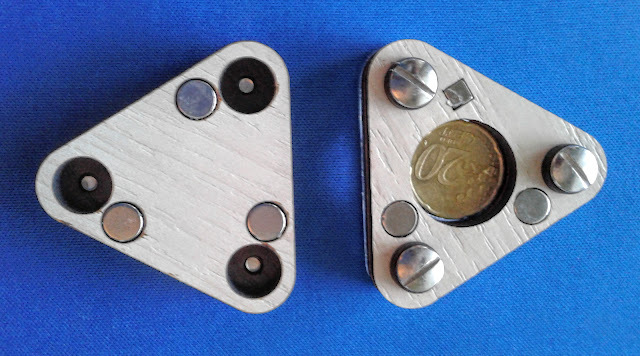 Two paired circular magnets and one other pair consisting of a circular magnet and a small, slightly weaker square magnet. All are spaced equidistant around the perimeter. Because of that one slightly weaker magnet, you theoretically should be able to separate the haves with more of a peeling action, opening a gap at the weak corner. I think that’s how it was supposed to function (Ed - how would anyone know which corner to begin peeling in?). But even the smaller magnet is pretty darn strong. The difference between the strong pairs and the weak pair is not really sufficient to make the trick work. Great idea, but as with all other critical elements of the puzzle, poorly engineered. So to sum up the puzzle: great concept, poorly executed. Expecting a dab of glue to hold a metal pin in a significantly larger diameter wooden hole seems particularly egregious. It does not seem that there was much effort expended in field testing these puzzles, if any. It’s hard to believe these issues wouldn’t present themselves pretty quickly. Very few I'm afraid. The holes are overbored and there is no changing that. I don’t believe they make these magnets in millimeter increments, so it’s unlikely that there is a slightly bigger magnet that one could tap in snuggly. The only option I see is to work the adhesive angle. I think Gorilla glue may provide an option. As I’ve recently learned, Gorilla glue expands as it cures. If one were to carefully apply it in the right quantity, it might bind up and hold the magnet in place. This is risky though, because this glue expands a lot, something like four times its original volume. No Gorilla glue should be put at the base of the hole because there is no room for expansion. 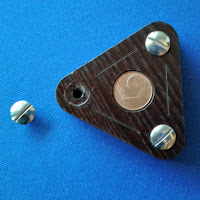 The magnet will be forced upward and break the plane of the puzzle surface. This would be fatal since the magnet needs to be flush for the puzzle to close tightly and seamlessly. Application around the sides may work. Any excess will ooze out the top, but can then be cut away. For the screw, same basic deal. I don’t see any other option but heavy duty adhesive. Another option, aside from Gorilla glue, might be some form of epoxy. This would avoid the expansion problem. Far from ideal situation either way, and I’m therefore going to wait a little while to stew on it before I do anything. All suggestions welcome. In the final analysis, even if all the magnets were secured properly, I still feel this puzzle is a little overpowered. It takes quite an effort to pull this thing apart. So much so that it borders on the puzzler’s bane, “use of force.” (Ed - IT IS VERBOTEN!!) A lot of people will not even be able to get it apart probably. Arthritics need not apply, nor children. I suppose they are not the target audience, but you get my point. The required effort is such that even if you had the genius to guess the solution, it would be perfectly reasonable to conclude you were wrong after moderate effort didn’t open it. It’s a fine line, of course. It has to be tight enough to be secure and not fluked, but I think this puzzle should yield just a tad sooner than it does. That’s just my opinion based on the two times I opened it. The issue of overpowered magnets has come up in the past. Other good examples are found in one or two of Mr. Strijbos’ puzzles which I think most folks agree have a tad too strong embedded magnets - forgive me Wil, and please don’t take me off your mailing list! That issue, however, is easily fixed (if there is interest, I can explain how in a later post). Euro Falle 05 might not be repairable by the average puzzler. It will certainly be hard to do so without making a mess of things. I nearly ruined my Euro Falle 02 trying to get its magnets back where they belonged. Yes, that’s right, this problem is not restricted to the Euro Falle 05. 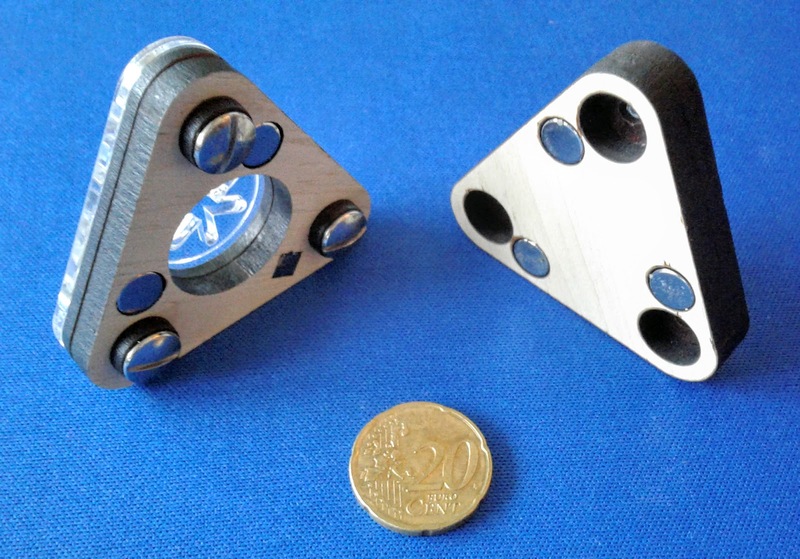 One of the magnets is currently detached from my Euro Falle 04, for example. I was able to repair the 02 with the aforementioned Gorilla glue and the 04 luckily remains functional as-is. But this fatal flaw is potentially present, to one degree or another, in all puzzles of the series. I now dread playing with any of them. But let’s end this post on a high note! 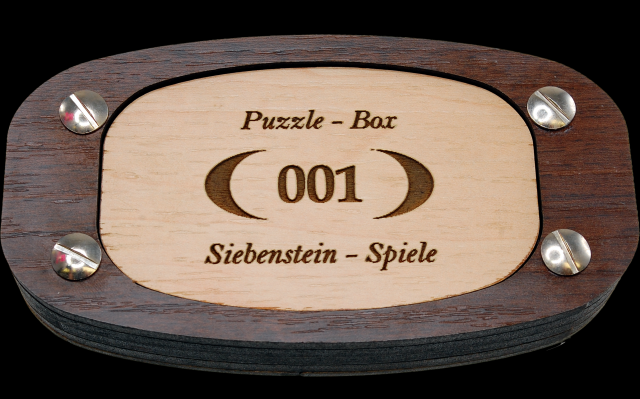 Puzzle Box 001, also brand new from Siebenstein Spiele, is absolutely fantastic! It is quite a beautiful puzzle and functions perfectly. I very highly recommend Puzzle Box 001. It shows the heights that Siebenstein Spiele can reach when they are on their game. Ed - Thank you Mike for such a detailed exposition about the failings of a very popular puzzle in a great series. I personally do not own any of these puzzles and am very grateful for the warning. It has been said that I very seldom, if ever, post a bad review and this may make you feel that I am in the pocket of the designers and producers. Maybe I have been very lucky or maybe I just choose well but I have very rarely had a problem with any of my purchases. I do tend to not review something if it is less than good but if there is a systematic problem then I will not shy away from informing people of it. If any other puzzlers feel the urge to post a review as a PuzzleMad roving reporter (good or bad) then please feel free to drop me a line via my Contact page. If English is not your first language then that's not a problem - I edit everything (even Mike's wonderful prose. Mike / Kevin - I had the same exact thing happen to my copy of Euro Falle 05. Mike's assessment is spot on. Thanks for the confirmation Steve. We really appreciate it. The magnets came out of my Euro Falle 2 and 3 and I crazy glued them back in and both work fine now. I was able to repair my 02 the same way. Not sure how its going to hold up over time though. I guess one doesn't replay with these very much anyhow. Note that 05 is far, far more powerful, so re-gluing may not be a good fix.